"[Since 1788], Australian policy makers and the general community have clearly moved in the direction of being both less fearful and more accepting of diversity. But the movement has been neither linear nor orderly. The plain fact is that there is no law of inevitable progress. In the last decade, at the national political level, we regressed." "We regressed over the last decade but not because the vision was flawed or outdated. Our society has changed greatly in the decades succeeding the initial implementation of multicultural policies and non-discriminatory immigration policies, but the principles mapped then endure." "And the fact remains that our commitment to non-discriminatory policy has been matched by a period of regression in our treatment of refugees. We have, over the past few years and with some success, tried to remedy this. But the prospect of slipping back is constant." 1 December 2005: Petro Georgiou keeps up the pressure - Again Mr Georgiou speaks about asylum treatment in The House, reporting on progress and partly to bring down considerable pressure on Vanstone's latest dealings with an Indonesian family, who quietly sailed into the Australian territory just a few weeks ago. 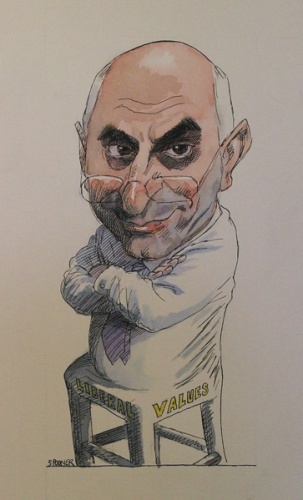 14 June 2005: Countering the Kooyong breakout: Howard supporters and their anti-Georgiou camp strategies - Since the February speech in Parliament by Petro Georgiou, several front-benchers in the Howard government have been beavering away in an effort to control the damage. 12 June 2005: A summary of the Georgiou Bills - This is a copy of communication sent by Petro Georgiou MP to all MP's in the Coalition government on 24 May this year. The communication summarises the two Bills tabled in the Coalition party room that same date. 8 June 2005: Debunking anti-Georgiou camp tactics - Myths are being peddled by A-G Philip Ruddock, Hon Peter Costello, intended to influence Mr Malcolm Turnbull and others in the Liberal-National Coalition, in what we see as an attempt to discredit the Petro Georgiou Bills. Here are the facts that debunk those myths. 18 February 2005: The Kooyong Break-out: abandoned backbenchers and 'small-l liberals' revolt - how Petro Georgiou, federal member for Kooyong, leads the quiet pack on a new trail of independence. "One Coalition senator crossing the floor after July 1 will be enough to defeat a Government measure opposed by Labor. Added pressures will come from a large back bench and the frustrated ambitions of those denied promotion." 18 October 2005: Petro Georgiou: Multiculturalism does not breed terrorism - This is Petro Georgiou MP's reply to the 2005 Anti-Terrorism Bills. "... the commitment to multiculturalism has been a demonstrably successful response to the diversity of our population. In the war against terrorism, multiculturalism is an ally and not an enemy." I would like to begin by acknowledging the Wurundjeri people who are the Traditional Custodians of this Land. I would also like to pay respect to the Elders both past and present of the Kulin Nation and extend that respect to other Indigenous Australians present. Professor Mark Considine - Dean of Arts, Mr David Adams and family, Melbourne University staff and students, distinguished guests. Thank you for the invitation to give the address at the 2008 Marion Adams Memorial Lecture. It seems to me that an annual public lecture is an exceptionally fitting way to celebrate the distinguished career of Professor Adams and her long association with Melbourne University, both as a student and as a respected member of staff. As Dean of the Faculty of Arts from 1988 until 1993 - significantly the first woman to be appointed to this position - Professor Adams played an important and far-reaching role within the university community. This role continues today, through the Marion Adams Fund and through the support given to the university by her husband David Adams. I am honoured to be here this evening. Since European settlement of Australia in 1788, political leaders and people in the community at large have contended with issues relating to ethnic, cultural, racial and religious diversity. How much diversity can be tolerated without jeopardising social cohesion? Who belongs in the identity we wish for ourselves and who does not? How should diversity be managed? What differences should be encouraged or tolerated and what should be discouraged or prohibited? Tonight I propose to examine the public policy responses to these issues historically and prospectively. In Australia, there are three key arenas in which the limits of racial, cultural, ethnic and religious diversity are tested. The first is in the relationship between indigenous and non-indigenous Australians. The second is at our borders as defined by our immigration policies. The third is in the policies directed at managing cultural and ethnic diversity in Australia. It is a deficiency of my presentation that it does not focus on the first of these arenas - the relationship between indigenous and non-indigenous Australians. Of all the components of our history, this is the one where a black armband is warranted. Unfortunately, constraints of time, talent and knowledge prevent me from doing this subject justice this evening. The position I will be advancing is in broad terms as follows. Governmental responses have at times been determined by an aversion to diversity and the perception that diversity threatens the welfare of the community. At other times, diversity has been seen to be a circumstance that could be reasonably accommodated and tolerated, and even beyond that, welcomed and respected. Over the period, Australian policy makers and the general community have clearly moved in the direction of being both less fearful and more accepting of diversity. But the movement has been neither linear nor orderly. The plain fact is that there is no law of inevitable progress. In the last decade, at the national political level, we regressed. The relationship between politicians and the community is a complex one. Our leaders make choices dictated by their personal and political values and also by their perceptions of social and political realities. Their statements and their actions are both influenced by and have an influence on the sentiments of people in the community. I believe that we are now in a hiatus - a gap between the immediate past and the immediate future. There is uncertainty about which direction we should take. This is my case for where we should head. But in order to orient ourselves, we first need to understand where we have been. I will start with an historical overview of how government and community responded to issues of diversity, identity and cohesion in the context of immigration and domestic policies. I will then offer some views of key issues we are faced with and how we should address them. Apart from policies towards indigenous Australians, immigration policies have historically seen the most significant measures dealing with the issue of diversity. Through much of the history of European settlement, national and racial favouritism determined who was excluded and who was sought. The fear of Chinese immigration which the Australian democracy cherishes ... is, in fact, the instinct of self-preservation, quickened by experience ... We are guarding the last part of the world in which the higher races can live and increase freely for the higher civilisation. In the first part of the twentieth century, the migration of other groups was also periodically restricted. Pacific Islanders were excluded in the very early days of Federation with those already settled here expelled. In 1924, a quota was imposed on Albanians, Greeks and Yugoslavs. It was only following the Second World War, fearing that Australia had to 'populate or perish', that the government extended immigration to people from European countries other than Britain. Even in the face of the perceived threat to national survival, the government was committed to minimising the diversification of the population. It is my hope that for every foreign migrant there will be ten people from the United Kingdom ... aliens are and will continue to be admitted only in such numbers and of such classes that they can readily be assimilated. The use of race and nationality as criteria of suitability for immigration began to be dismantled by the Menzies government. The White Australia Policy was ended by Gough Whitlam in 1973 and was buried by Malcolm Fraser with the acceptance of Indochinese refugees. The progressive dismantling of the discriminatory barriers was an achievement of political leadership - dare I say statesmanship - not electoral necessity. Public opinion was divided. But those who believed the Australian community would generally accept the reforms appeared to be vindicated. By the end of 1970s, I thought the status of the non-discriminatory immigration policy was well assured. Non-discriminatory immigration, in particular from Asia, continued to be assailed within political circles and by prominent intellectuals, such as leading historian Geoffrey Blainey. And this was not just a sideshow. I do believe that if it is - in the eyes of some in the community - that it's too great, it would be in our immediate-term interest and supporting of social cohesion if it were slowed down a little, so the capacity of the community to absorb it was greater. Prime Minister Bob Hawke responded by introducing a parliamentary motion stating that no Australian government would use race or ethnic origin as a criterion for immigration. Four members of the Liberal Party crossed the floor to vote with the government. Seven years later, John Howard said he regretted his statement, maintaining this position for the remainder of his Prime Ministership. I believe we are in danger of being swamped by Asians. Between 1984 and 1995, 40 per cent of all migrants coming into this country were of Asian origin. They have their own culture and religion, form ghettos and do not assimilate. The Hanson phenomenon had a major impact. Whatever criticism that can be made of the major political parties in their response to Pauline Hanson, it is to their ultimate credit that they maintained their commitment to the principle of non-discriminatory immigration. That this House ... reaffirms its commitment to maintaining an immigration policy wholly non-discriminatory on grounds of race, colour, creed or origin. The motion was carried in both houses of Parliament. The pressure for discrimination built up again following the 2001 terrorist attacks in the US and later in Bali, Madrid and London. Pauline Hanson and others called for restrictions on Muslim immigration. Heightened national security fears have always placed great strain on our commitment to principle. That no major political party contemplated a return to a discriminatory immigration policy which in a climate of fear could have been exploited with effect, demonstrated how much we had changed. I was greatly relieved. It was a very significant demonstration of how far we had come as a society. In my youth, it was controversial to suggest that race and nationality should not be factors in our immigration policy. In my early adulthood, we changed with remarkable ease from rejecting people from coming to Australia because of their colour, to accepting them. I think that I am in unison with most Australians and certainly with my children in believing that we are a better society for this. The weight of opinion has shifted decidedly. That is a remarkable development. But as my brief overview has shown, our achievement was not pre-destined nor is it invulnerable to challenge. We have got there. But it has been by fits and starts. Maintenance of non-discrimination at our borders needs to be reinforced constantly. Vigilance is required and particularly if prosperity ebbs. And the fact remains that our commitment to non-discriminatory policy has been matched by a period of regression in our treatment of refugees. We have, over the past few years and with some success, tried to remedy this. But the prospect of slipping back is constant. I believe that we have learned that the policy of mandatory detention hurts vulnerable men, women and children. I also believe that it damages our own humanity. As in immigration policy, the overall movement has been towards greater acceptance of diversity but not without resistance and regression. I have talked on many occasions about multiculturalism as the most sensible policy framework for a society which sought to address how to properly and justly treat the many diverse people who migrated here after World War Two. In dealing with this diversity, religious differences were not the central issue. Today however, religious diversity has emerged as a new focus of contention. It needs to be re-emphasised that history shows us that conflict and the resolution of conflict based on religious difference is not new to Australia. We should acknowledge this when we are dealing with what appear to be novel issues regarding the place of religion in our society. We should recognise that Australia's historic responses to religious conflict have endowed us with a legacy that is relevant today, and that lessons from the past can inform current policy directions. In the colonial era, among the newly arrived settlers, a pre-eminent difference was between those of Irish Catholic origins and those of English Protestant background. A heady combination of ethnicity, nationality and religion gave rise to distinct identities which found expression in outbreaks of violence, in economic and social discrimination, and in disagreements about public policy. This is exemplified by the armed rebellion of Irish convicts at Vinegar Hill in 1804. Catholic priests were blamed for contributing to the spirit of the rebellion, and were punished by having their permission to minister withdrawn. By the mid-1800s, however, sectarian tensions had diminished. On St Patrick's Day in 1859, Catholics and Protestants in the community of Yass came together at a civic function where community leaders of both faiths praised the local residents for being, in the words of one, able to "appreciate the sterling good qualities of each other without reference to race or creed". But over the next two decades, this harmony again began to wilt. The attempted assassination of British Prince Alfred by Irishman Henry James in 1868 led to a strong anti-Catholic reaction. Henry Parkes, who coined the phrase "we are one people, with one destiny", and is often described as the Father of Federation, had some problems with "one people". Parkes saw the Irish as "jabbering baboons and disruptive trouble makers". One consequence was the withdrawal of state funding to all faith-based schools. The promotion of secular education for all was seen as a measure to address the divisiveness of religious diversity. During the First World War, Catholics and non-Catholics were divided by the issue of conscription. Many Catholics, particularly those of Irish origins, did not want to fight for Britain. But later in the twentieth century, the intensity and sweep of the sectarian rift again abated. By the 1960s, Catholic and Protestant groups were campaigning together on the issue of state aid for religious schools. The Menzies government reintroduced government funding for denominational schools and this became a bipartisan policy. By the time I became Director of the Institute of Multicultural Affairs in 1980, it was common to hear the majority of Australians being described as Anglo-Celtic in origin. Given the history, it was a confected identity and the term was by no means universally accepted. But the very fact that it was coined and widely used reflects the erosion of a long-standing and powerful division which previous generations might well have regarded as insurmountable. Migrants from non-traditional source countries apparently had something to do with overcoming this division. By the late 1940s, we found ourselves combined in mistrust of the Balts, southern Europeans and other "reffos." ... . [T]he streets of our suburbs ... were full of men and women who believed [these] arrivals would never become an effective part of Australian society. Their strangeness disqualified them. Well, reffos like me are always pleased to have a positive effect, no matter how unintended, but the bottom line is that when my family arrived in Australia in the 1950s, we were expected to assimilate as soon as possible. But, we were never sure what we should assimilate to. What this meant was not specified in laws and regulations or even images. What we were sure of was that we had to discard valued aspects of our original culture and heritage. Manifestly, the expression and celebration of languages and cultures of so-called New Australians were tolerated rather than respected. We could do what we wanted in our private spaces, but public recognition and support were not forthcoming. As the number and diversity of migrants increased, it became apparent that assimilation was not a necessary or equitable policy, and that people were not ready to abandon valued identities. The fact was that migrants overwhelmingly did commit to Australia, its democratic values and institutions and to English as the national language. At the same time they created schools, religious institutions and voluntary associations to preserve and develop cherished elements of their cultures. They worked assiduously to change the attitudes of politicians, of the media and of the public at large. Assimilation gave way briefly to integration but the opportunity was there for a more inspired policy response: a multicultural policy for a multicultural nation. Gough Whitlam made the first significant move in this area and Malcolm Fraser made the commitment to multiculturalism in policy and institutional terms. The strong imprimatur of the head of government was essential and Prime Minister Fraser provided that, in public and in private. As he explained in a keynote speech in 1981, the decision to respond to ethnic diversity with multicultural policies was based on both realism and idealism. Multiculturalism is concerned with far more than the passive toleration of diversity. It sees diversity as a quality to be actively embraced, a source of social worth and dynamism. It encourages groups to be open and to interact, so that all Australians may learn and benefit from each other's heritages. Multiculturalism is about diversity not division - it is about interaction not isolation. It is about cultural and ethnic differences set with a framework of shared fundamental values which enables them to co-exist on a complementary rather than a competitive basis. It involves respect for the law and for our democratic institutions and processes. Insisting upon a core area of common values is no threat to multiculturalism but its guarantee, for it provides the minimal conditions on which the well being of all is secured. The last part of this passage is particularly important. It authoritatively refutes the misrepresentation that the policy of multiculturalism does not insist on a core of shared values pertinent to all, and which promotes or is indifferent to separatism. In the case of multiculturalism, this is the limit of tolerance. Over the following decades, multicultural policy evolved. Bob Hawke initially vacillated and then acknowledged its importance. Paul Keating was a strong supporter of the policy. Australia made an error in abandoning the former policy of encouraging assimilation and integration in favour of multiculturalism. John Howard had reservations about multiculturalism because he believed that it denigrated our national identity and undermined our social cohesion. It tolerated too much. At the beginning of the Howard government, some of the public manifestations of multiculturalism were stripped. The Office of Multicultural Affairs and the Bureau of Immigration, Multicultural and Population Research were both abolished. Nevertheless, in 1999, John Howard signed off on a manifesto on multiculturalism. A New Agenda for Multicultural Australia was released as government policy, in response to a report conducted by the National Multicultural Advisory Council. Multiculturalism had public support and the Prime Minister's endorsement. The terrorist attacks on Western targets, compounded by the extremist Islamist attack in London where the perpetrators were mostly born and bred in the UK, generated powerful new challenges. Strong concerns were voiced that multiculturalism permitted and facilitated the propagation of radical or fundamentalist Islamic ideas. Religion - and Islam in particular - replaced ethnicity as the key aspect of the policy debate which multiculturalism was seen to encompass. In the atmosphere of concerns about social cohesion, so-called 'mad' multiculturalism and Islamic extremism, the government, in early 2006, introduced the idea of new testing arrangements for citizenship. The twin challenges of global terrorism and the ageing population require us ... to become even more skilled at integrating an increasingly diverse population. The notion of the new test as a counter-terrorism measure was obviously unsustainable and was soon abandoned. Instead, the idea that the test would promote social cohesion generally became the central justification. Advocating the equality of cultures, or a community of separate cultures, fosters a rights mentality, rather than a responsibilities mentality. It is divisive. His comments foreshadowed the demise of the term multiculturalism from official language. A couple of months later the Department of Immigration and Multicultural Affairs was renamed the Department of Immigration and Citizenship. In October 2007 the new citizenship test was imposed. I strongly oppose the test and have argued that its introduction signifies a regression in our policy, harms aspiring citizens, diminishes us as a nation and seeks to impose a template of citizenship and national identity. It is not the role of government to impose a top-down model of national identity for the rest of us. Government should not be manufacturing identities. Its role should be to foster a society that allows Australian people the security, freedom and opportunity to define what they believe it means to be Australian. In Opposition, Labor supported the legislation, but in government appointed a committee to review the test. The concept and direction is right ... ..we just want to make sure all the details are right for the future. I think the Don is safe. The citizenship test review committee reported to the Government in August, but its report has not been published and the government has not indicated its likely response. And has done so since the government came into office. The reality is that the Rudd Government's approach to multiculturalism remains opaque. The reality of our diversity is as inescapable now as it has ever been. Racist violence does occur but it is not indicative of the state of relations between Australians of different backgrounds. The events in Cronulla in 2005 were exceptional, a product of specific circumstances of time and place. The Human Rights Commission and other bodies have documented religious and racial prejudice and discrimination which adversely affect the wellbeing of the individuals and groups who are targeted. Arab and Muslim Australians have been particularly affected over the last decade. Racial and religious intolerance is a blight we must address as we do other social problems but we have to put its incidence into perspective. The evidence suggests that there is much interaction between people of different backgrounds and that these interactions are by and large harmonious. The overall integration of people from different nationalities, into the wider Australian community is evidence of the success of a multicultural policy that was about greater choice rather than coercion. Migrants and their children have not been trapped in ghettoes, cut off socially and economically from the mainstream. They have been influenced by - and have themselves influenced - the society at large. What governmental and broader political action is needed to regain lost ground and continue along the path that was so productive? It's time for a reaffirmation by our political leaders of a commitment to non-discrimination in immigration and multiculturalism domestically. This is of primary importance symbolically. There needs to be a commitment to promote a standard of accountability for the delivery of policies that ensure and promote the values of multiculturalism. Other jurisdictions in Australia and overseas have various forms of political affirmation that might be considered. These include legislative instruments, such as Canada's Multiculturalism Act enacted in 1988; and Victorian legislation enacted in 2004. Equality of opportunity was affirmed by Mr Fraser as a central tenet of Australian multiculturalism. Successive governments have committed to the principle and funded assorted measures to assist migrants - in particular the most vulnerable such as refugees and non-English speakers. Equality of opportunity is a principle we have far from achieved and whose realisation will always require ongoing efforts. The Rudd Government has a social inclusion agenda and has established a Social Inclusion Board. The terms of reference of the Board are extremely vague and make no mention of multiculturalism, or disadvantage experienced by migrants and refugees. I believe that the Government should establish an independent statutory body that addresses issues of multiculturalism and migrants and refugees, and that has a strong mandate to rigorous research, monitoring, reporting and advising. Almost forty years of experience with departments has persuaded me that the body should report to the Prime Minister. SBS - the Special Broadcasting Service - was established 30 years ago because the ABC and commercial services largely ignored the particular needs and interests of many Australians. Its aims were not only to address the major gaps in provision for people of non-English speaking backgrounds but also to promote understanding of cultural, linguistic and ethnic diversity. I think SBS has done some terrific projects, relating to Australians of all backgrounds, indigenous and non-indigenous. The manner in which we have made multiculturalism part of the character of our national broadcasting is a uniquely Australian achievement. But I am mindful that many who should be among its staunchest supporters feel concerned at how its $180 million annual budget is spent. I don't begrudge the pleasure many viewers get from shows like Top Gear and South Park. But where, for example, is the investment in programming to encourage and facilitate the learning of English? The purposes for which the Service was established remain relevant to our evolving multicultural society. I believe that we need an independent and comprehensive review of how successfully SBS is meeting its intended purposes of the furtherance of English and language learning, the facilitation of settlement, the right to maintain a cultural identity and the promotion of mutual understanding between diverse communities. It needs to report on how those purposes can be pursued most effectively in a dramatically new digital media environment, where entertainment and information are transmitted over the internet, MP3 players and DVDs as well as TV and radio. Finally, we need to address our concerns about accommodating religious diversity by drawing on the lessons of how we dealt with this issue in the past. the thin end of the wedge in the creeping campaign to introduce Islamic jurisprudence into our legal system. A nation with two legal systems, reflecting conflicting social and political philosophies, is a house divided and, as history shows, it cannot stand. In his view, it was an instance of "mushy multiculturalism" which could weaken traditional national values to the point of collapse. Let me make it clear, respect for the rule of law enacted by parliament has always been a non-negotiable and central tenet of the policy of multiculturalism. For the most part, the laws or ethical systems of Islam and of other faiths dictate behavioural standards that sit quite readily within or alongside the framework of civil law. But even were Muslim Australians to ask the parliament to consider elements of their faith in framing laws, this would not represent an unprecedented challenge to our law and our society. On occasion, Australian legislators have dealt with such situations by making provision within the law for conduct in accordance with religious dictates. A number of long-standing federal laws contain provisions which accommodate conscientiously-held views, whether specifically faith based or secular as well. Victoria and other jurisdictions long ago legislated that parents who believe blood transfusions infringe their faith do not have right to deny this treatment for their children in life-threatening situations. The Victorian Parliament is considering a law requiring doctors who have a conscientious objection to abortion to refer women to other providers; strong requests to drop this provision have come from people of Catholic faith. The second concern is with regard to faith-based schools, which some commentators argue represent a threat to secular, liberal democracy and promotes separatism. Former Age editor Michael Gawenda has recently suggested that it was ironic that John Howard was determined to roll back multiculturalism but was inadvertently its great champion through the government's strong financial support for faith-based schools. It's not always clear whether those concerned about this policy are suggesting that faith-based schools should not receive public funding or that they should be prohibited. Either measure is highly problematic from a number of perspectives. We've gone down the path of no state aid to private schools. It resulted in a three-tier education system - the wealthy independent sector, some of which was strongly faith-based; the secular state system; and poor mainly Catholic schools. It was highly inequitable. Reverting to that policy strikes me as a recipe for greater division. Reject those claims which, if implemented, would result in an interference of the basic rights and liberties of citizens who do not share the religious viewpoint. They should also reject those claims if their implementation would run counter to the contemporary social values of equality, tolerance, compassion and dignity for all people at all stages of the life cycle. In a democracy, people have the right to advocate their view of what public policy should be, whether their views about the right course of action are based on religious or secular ethical foundations. The politician's job is to consider and assess those views on their merits, including the impact on all members of the community. The challenge is in the implementation. Almost 30 years ago, when I was director of the Institute of Multicultural Affairs, people asked me whether I had a vision of a multicultural Australia in 2000. I said that I hoped it would be a society where, within a framework of key shared values, people had the opportunity to choose who they wanted to be. If they wanted to maintain elements of the culture of their origins that do not violate Australian laws, they should be able to do so. If they wanted to speak and read the language of their origin, as well as learning English, they should be able to do so. And if they wanted to adopt everything iconically Aussie, and forget about everything else, that was fine too. This is the logic of the policy of multiculturalism. For government, the key premise was that confecting or promoting a specific national identity was beyond the state's proper duties and competence. Rather, its role was to foster the development of an environment in which people have a reasonable opportunity to define who they are and wish to be. With regard to the community, the foundation of multiculturalism was confidence that the capacity of Australian society to accommodate diversity was far greater than many believed. That fears that the nation would divide did not come to fruition is a testament to our ability to embrace diversity. We regressed over the last decade but not because the vision was flawed or outdated. Our society has changed greatly in the decades succeeding the initial implementation of multicultural policies and non-discriminatory immigration policies, but the principles mapped then endure. It's a message that those who walk the corridors of power in Canberra need to be reminded of - loudly and persistently. I hope you will join me in doing that.